At the SQL Server Instance step of the wizard, specify a Microsoft SQL Server instance that hosts the Veeam ONE database. 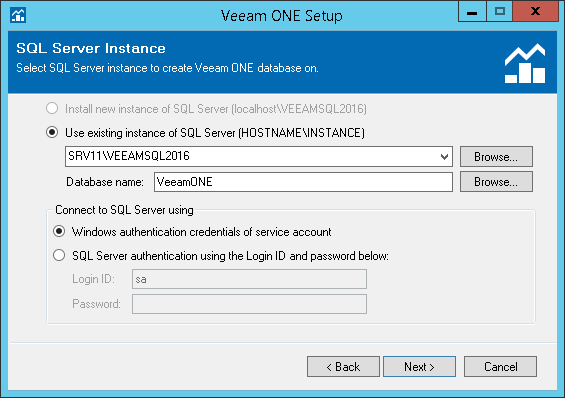 Select the Use existing instance of SQL Server option and choose the Microsoft SQL Server instance that hosts the Veeam ONE database. In the Database name field, specify the name of the Veeam ONE database. Provide credentials for the account that Veeam ONE components must use to access the database. You can enter credentials explicitly or use Windows authentication credentials of the Veeam ONE service account to connect to the Microsoft SQL Server. For details on required permissions for the account, see Connection to Microsoft SQL Server.